So it’s Daring Bakers time again, and wouldn’t you know it, I’m a day late again. 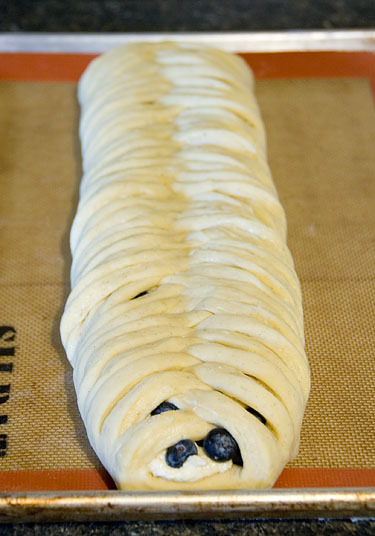 This time around the challenge was a rich laminated yeast dough: The Danish Pastry braid. I’ve made both croissants and danish years ago in pastry school, but I’ve always shied away from making these at home. You see, laminated doughs and me are good friends, but once yeast joins the party and starts puffing things up in my warm kitchen, all bets are off. Adding yeast to these doughs, I’m told, makes laminating them easier. Personally I don’t find this the case and would rather do double turns of puff pastry dough until my hands fall off…but the mice are gone and I haven’t been the most productive Daring Baker so I soldiered on. We were given some leeway with the fillings of our braid. The challenge provided a recipe for an apple filling but we were allowed to substitute anything we could think of if we wanted. 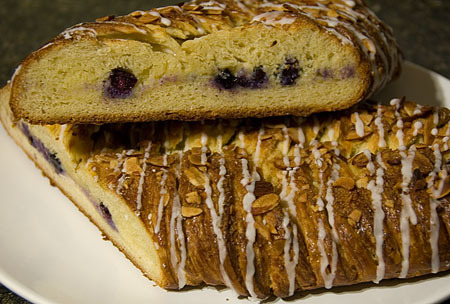 Since apples are a fall fruit and it’s now just summer, I decided to come up with my own filling – blueberries and frangiapanne. The recipe we used was pretty spot on and typical for a laminated dough. There’s lots of down-time in this recipe, but if you know what’s going on, you can cheat the rest times and save yourself at least an hour or so. I decided to make the dough and complete all the turns one day and shape, proof, and bake the braid on the following day. It was quite surprising to see how much the dough expanded during the overnight rest in the refrigerator; it probably doubled in size. Before I rolled the dough out to its final size, I gently flattened the dough down to a more manageable size. Once it was flattened, it easily rolled out into a very large thin sheet. The full sized braid just barely fit on my half sheet pan, but it at least fit. I was slightly worried that after proofing it would overhand the sides, but that never happened. 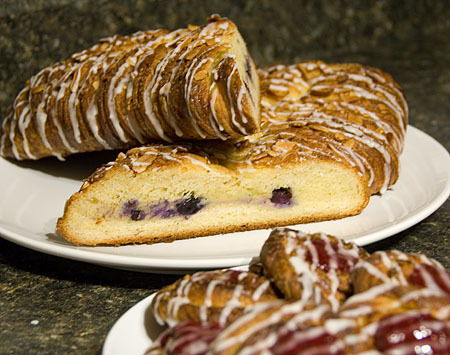 Even with this large sized braid, I had enough scraps leftover to make a few small round danish. The scraps were cut into long, thin strips, twisted, and then coiled into circles. I made indentations in the center of each so there would be room for filling after they baked. 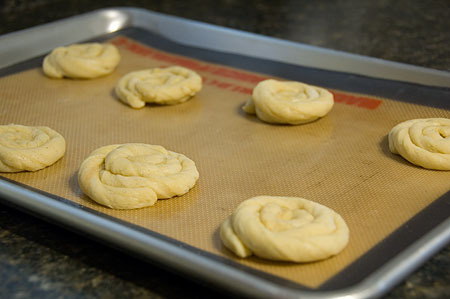 Both pastries proofed quickly in the early summer heat, probably less than an hour and they were doubled in size. The small danish baked off rather quick, about 10 minutes while the braid probably only took 15-18 minutes, tops. 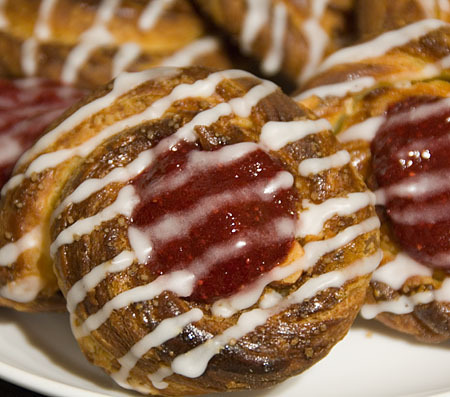 After baking I lightly iced both pastries and filled the small danish with a strawberry compote. The recipe was pretty good. There’s a bit too much stuff in it for my liking – cardamom, orange zest, orange juice, vanilla bean, vanilla extract…One or two of these are a nice addition, but all of these together seemed to have gotten lost. I even skipped on the oranges and I still thought it was too much stuff. Overall things turned out well; if I made this again, I’d make some adjustments to the recipe – double turns to save some time, less stuff, and probably more shapes. The braid is nice but I’m a real sucker for the small, individual pastries. Great job, it all looks so good. I wish I could take a bite. they look beautiful, though I can’t believe they puffed up so much. Mine were pretty flat. Great job! I love the little blueberries peaking out AND those lovely little rounds. Nice looking little ones! Had you thought about rolling up the edges there just a bit, so that they’d be little bowls? That way they could hold more filling! Hey – just pretend you’re in a different time zone! There are folk way out in GMT+10 (Australia), and there are folk way back in GMT-8 (California) and perhaps even somebody in GMT-10 (Hawaii). So, there are people who post 18 hours ahead of California’s midnight and are still ‘legal’ about it. I like how you iced your Braids. Great job! tsk tsk tsk.. bad bad Daring Baker *giggles* I am kidding.. it happens to all of us.. but hey you made it and that is what counts!!! I am sorry that you and yeast are not the best of friends.. perhaps you need to bond in some other way (I really don’t know what I am talking about anymore)..